K&N air filters - these are the original high-flow air filters. Since 1969 K&N Engineering has been designing, manufacturing, and enhancing high-flow air filters truck, car, SUV, and motorcycle enthusiast interested in maximizing horsepower, acceleration, and fuel-efficiency. K&N not only has more applications than any other manufacturer of similar product, these guys invented the high-flow category and high-flow technology. How good is K&N? Well, they're the only air filter used at the Indianapolis 500®. The K&N FilterCharger® air filter is designed to achieve high, virtually unrestricted air flow while maintaining filtration levels critical to ensure long engine life. A K&N filter directly replaces the factory filter, making for a quick and easy install. K&N air filters are constructed using 4 to 6 layers of cotton gauze, which is between two epoxy-coated aluminum wire screens. The cotton is treated with a formulated oil, which is designed to capture dust particles, allowing for a cleaner air to pass through to the engine. K&N filters can last up to 50,000 miles before needing to be cleaned – depending on driving conditions. Once cleaned, they go right back to work under the hood. This filter is going to last longer than the vehicle it's installed in, and K&N backs that statement with a million mile limited warranty. If you don't have a K&N air filter in your vehicle, you're basically lighting money on fire and robbing your vehicle of power and efficiency. Not sure about you, but that's not something I'm interested in doing. Get you K&N air filter today, and reap the benefits…for a long time! Use the K&N Cross Reference Guide if you know a manufacturer's part number! Engine Protection, Filtration. Anyone can flow more air. The trick is to flow more air safely. In our opinion we hit the sweet spot – an optimal blend of high air flow, filtration efficiency, durability and dust capacity. We take filtration seriously. K&N Air Filter media has been tested both in-house and by independent labs using the ISO5011 test developed by the Society of Automotive Engineers. In addition we test many of our filters both in and out of the OE air box ensuring proper fit and function. Our goal is to design filters with the maximum possible airflow achievable while providing guaranteed engine protection. A K&N Air Filter is made of 4 to 6 layers of cotton gauze sandwiched between two epoxy-coated aluminum wire screens. The cotton is treated with a specially formulated grade of oil causing tackiness throughout the cotton’s microscopic strands. The nature of the cotton allows high volumes of airflow, and when combined with the tackiness of the oil creates a powerful filtering media that ensures engine protection. In contrast, most other media cannot maintain the same balance of airflow and filtration throughout the filter's life without sacrificing one or the other. With a K&N Air Filter, there is no sacrifice. K&N uses independent laboratories to help ensure that our products meet or exceed your high performance and high filtration demands. Better yet, we conduct our own testing at our own state-of-the-art in-house testing laboratory. For more information on K&N air filters and testing go to the K&N Technical Learning Center area. K&N’s dedication to providing a first-class air filter can also be seen outside the testing laboratory. Consider that K&N has sold more than 20 million air filters since 1969. One such filter was put in the air box of a three-quarter ton Chevy pickup and driven more than one million miles by Carl Judice of New Iberia, Louisiana. Carl points out that he has never rebuilt the engine, nor removed the cylinder head from his trusty pickup truck. Real world testing and customer satisfaction doesn’t get any better than that. Fuel economy testing and mileage claims are a tricky business. Just ask the EPA, whose website states, “EPA’s fuel economy estimates are designed to allow consumers to comparison shop. Your fuel economy will almost certainly vary from EPA’s fuel economy rating. This is based on a number of factors, such as weather, road conditions, you’re driving and maintenance habits, and your use of air conditioning.” Under Gas Mileage Tips they go on to say, “Replacing a clogged air filter can significantly improve your car’s mileage”. A lot of exaggerated claims are made in the marketplace by products claiming to improve gas mileage. 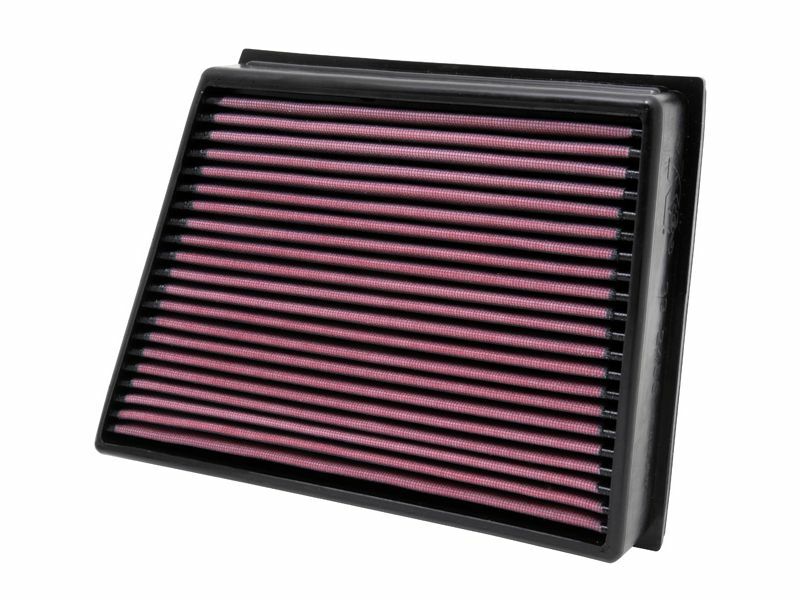 K&N makes no general fuel economy claims, however we encourage you to try our air filter for yourself. Keeping air filter restriction as low as possible can be an important tool, among others, for maintaining high mileage. K&N direct fit stock replacement air filters are a direct replacement of the factory air filter. K&N air filters can be installed in a matter of minutes, and those precious minutes will pay off indefinitely. If you have any questions, give us a call at 877-216-5446.